We are delighted that one of the Airmen in ‘Allo ‘Allo is being played by Tom Seymour. In the Second World War Tom’s father served as a navigator in the RAF. During that time he flew 17 missions over France. They involved both dropping supplies for the Resistance and dropping British Agents by parachute to serve alongside them. For this distinguished service in these secret missions Tom’s Dad was awarded Croix de Guerre. 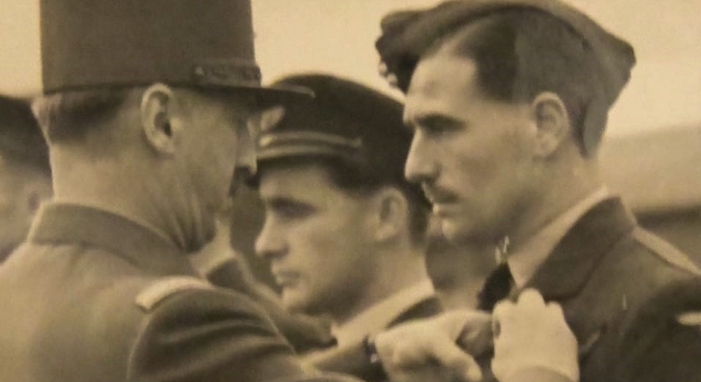 The photograph shows the medal being pinned to his chest by General Marie-Pierre Koenig, the head of the French Force Interieure on 24th September 1944. Tom’s role in the play will be a small comedic tribute to his father and his brave comrades. ‘Allo ‘Allo runs from Thursday 7 July until Saturday 16 July (not Sunday) at Sophia Gardens, at 3pm (Saturday Matinees) and 8pm. Tickets are available at https://www.ticketsource.co.uk/event/123202 or on 0333 666 3366.